This unique India's first Air Conditioner with Himalaya Cool & Monsoon Comfort Technology gives you the best of best comfort during hot summers & rainy / humid season.Despite giving you the best cooling this new Star rated Air conditioner gives you best saving in electricity bill as well. 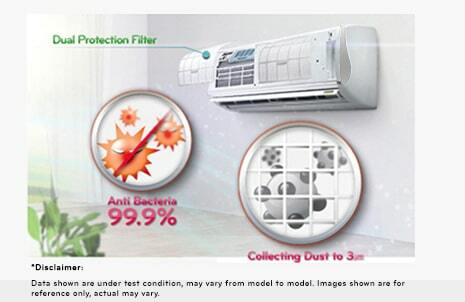 It's Elegant design fits your interior & makes you feel a proud owner.And last but not the least, its unique 3M Micro and dual protection filter ensures every ounce of air you breathe is clean. The Himalaya cool technology provides instant cooling to user by focusing on cooling the living space through smart airflow & 2 times faster vertical air swing. It can be activated by a one touch key on the remote controller. Using this technology the room is cooled up to 28% faster & saves energy up to 28%. 3M Micro Protection filter collect harmful microscopic substance by it strong electrostatic force on the surface of filter , thus ensuring clean air and enhance cooling performance of air conditioner. Energy saving mode is an operation mode that consumes minimum energy while maintaining body comfort by applying Body Adaptation Time Algorithm (BATA) to Air Conditioners. By pressing a single key on the Remote Controller the, display on the Indoor Unit will turn "OFF". Increasing comfort during sleep. These special glow buttons on the remote control help you in easy operation at night. LG offers unique microprocessor programmed that automatically increases the temperature to match your body metabolism in the night thus giving you a comfortable environment to sleep and saves power also.